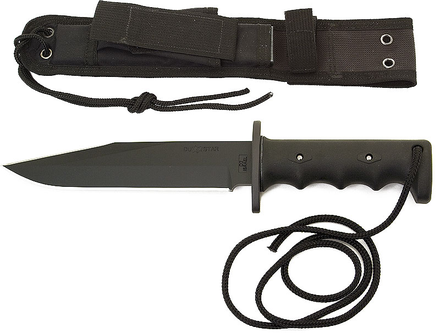 The DUSTAR Model 1 – Arad is the first-ever fixed-blade, heavy duty, all purpose utility/field/combat knife conceived, designed, tested, perfected and manufactured entirely in Israel.The knife was manufactured entirely by CNC technology. The blade was subject to extreme durability tests, normally not expected during even a lifetime of service. These included hard blows against a D2 block,which was consequently deeply marked,but left no scratch on the blade. The handle of the DUSTAR Model 1 – Arad is made of fiberglass reinforced nylon – the apex of strength, durability, and practicality. The handle is attached the blade by two hardened steel pins that would not loosen even under the most demanding conditions.